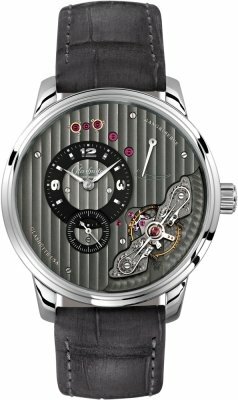 Buy a Glashutte Original watch from Prestige Time at discounted prices. Get award-worthy customer service and free shipping. Large selection in stock. Originating in Saxon and with many iconic luxury watches over the years, Glashütte is known for their precision engineering in their perpetual calendar watches and certified chronometer watches. 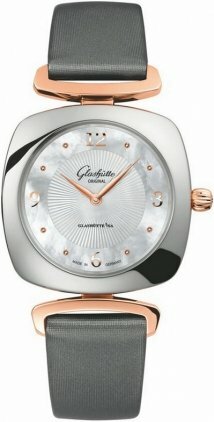 Glashutte produces many wristwatches with high complications such as the tourbillon. 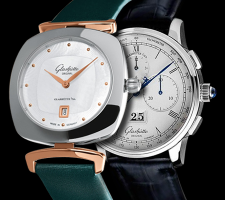 Glashutte Original Watches have a history that began in 1845 when Ferdinand Adolph Lange, master watch maker in the town of Glashutte began with a vision of creating high precision elite watches in limited numbers. This philosophy stuck with the brand as it evolved with new advancements in design and technology, including some of the most complicated movements of the era. Glashutte became the epitome of German precision horology and their watch parts became commonly used in other leading watch brands. 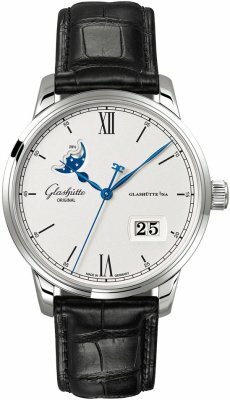 Today's Glashutte watch collections build on this fine history expressed through each collection. The most popular collection would be the Pano series of watches. 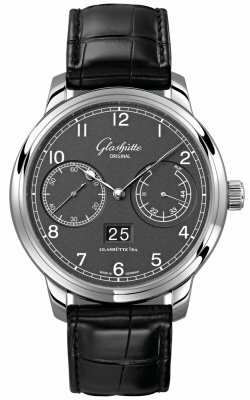 The Glashutte Pano watch collection is available in a classic size as well as a bolder XL 42mm case diameter. The watches are primarily available with automatic wind movements; however there are a few with mechanical manual wind movements such as the Pano-Reserve and the Glashutte PanoTourbillon. 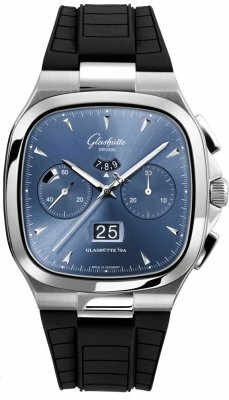 The Pano version with the automatic wind movements are called the PanoMatic watches, these Glashutte watches are instantly recognizable by their offset dials and their large oversized date window. The Glashutte PanoMatic versions are available with various complications such as the PanoMaticChrono with a raised stop-seconds ring, the PanoMaticLunar with an elegant Moonphase complication, the PanoMaticReserve, the more classic PanoMaticDate, the PanoMaticVenue with a 24 hour GMT complication, and the PanoInverse which has an unfinished and unique dial. Also available is the PanoMaticCentral which is somewhat different in that it has a regular centered dial rather than the traditional off-centered dials usually seen on the Pano collection watches. The Glashutte Senator collection is also extremely popular, with the watches being for the most part, more casual and are available in steel or precious metals. The Senator watches feature similar complications such as the Glashutte Senator Chronograph, and the Senator Panorama Date and Glashutte Panorama with Power Reserve. In addition, this collection has some unique and different complications such as the Senator Meissen which features a porcelain dial with the Meissen logo, the Senator Perpetual calendar which has a special dial setup, the Senator Calendar Week, and the Senator Rattrapante split second chronograph. Also noteworthy are the Senator Sixties collection available in plain automatic or with a chronograph - the Senator Sixties are unique with their shaped sapphire crystal case backs. Also available in the Senator line is the Senator Navigator watch series; these watches have brushed finished cases and come with stressed straps giving them more of a casual look. The Glashutte Senator Navigator Series includes the Senator Navigator Perpetual Calendar, Senator Navigator Chronograph and the Senator Navigator Automatic. Last but not least, to wrap up the Senator collection is the tonneau shaped Senator Karree Collection available with many of the similar complications, such as the Senator Karree Tourbillon, the Senator Karree Perpetual Calendar, the Senator Karree Chronograph, and the Senator Karree Automatic. Simple, yet elegant, the Senator Collection can suit any occasion. The name says it all for the Glashutte Sport Evolution collection of watches. These Glashutte watches are rugged, durable and great for day to day wearers. They are available with multiple complications, such as the ultra complication Glashutte Sport Evolution Impact Tourbillon and the Sport Evolution Perpetual Calendars. However other options that are easier on the pocket and heart would be the Sport Evolution GMT with a two time-zone complication, the Sport Evolution Chronograph, and something for the ladies with the Sport Evolution M 37mm size. Worthy of note is the Sport Evolution Impact generation of the Sport Evolution where the actual movement is protected by four rubber cushioning elements designed to absorb shock. The luxurious Star Collection features modern, artistic designs, lined with diamonds on the casing and floating diamonds in the shape of stars or other forms. The Star Collection is available in both manual wind and automatic wind. The Glashutte Lady Serenade Collection features a new generation of classic women's watches to suit many different occasions. Mostly casual, but also very elegant, the Lady Collection appeals to the feminine side of Glashutte's customers. The peak piece in the Glashutte Lady Collection is the Lady Serenade Tourbillon, which is completely covered in diamonds.